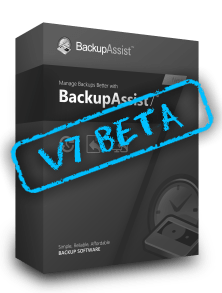 You may have picked up from our subtle marketing that something new is on the horizon with the next release of BackupAssist, Version 7. Now the public Beta is here I’m excited to be able to finally tell you all about the new features, which include a completely reworked interface design. Upon opening up the BackupAssist application, the user is now presented with a much simpler interface with three main sections for backup, restore and recovery. The job wizard has been reworked and the focus is now more towards scenario-based rather than specific job types and so should prove easier for first time users to pick up. The interface has been simplified and any duplication of options removed which makes it feel a much slicker user experience. The colour scheme and layout has also been designed to blend well with the latest releases of Microsoft operating systems, making it feel much better integrated. Jobs management and monitoring is still available as before but with a cleaner looking layout to help the important information stand out. Along with the overall design improvements some key new features have been added. Central Administration has been added to Version 7. This is the first iteration of this feature which enables backup administrators to easily remotely control BackupAssist over a built-in Web interface. Ideal If you have multiple BackupAssist installations on the network you need to control from a central management console. This change is somewhat under the hood, but key for all administrators of Server 2012, and the new Microsoft imaging engine it brings with it. BackupAssist can now fully utilise this version of the imaging engine in all its imaging jobs. 2TB VHD file limits are no longer a limit in this release which means imaging can now be used for a much wider range of jobs. As always, our Australian friends at developer Cortex are keen for your feedback so please help them make this the best release it can be by visiting their Beta announcement page and downloading a copy of the latest version!